A foreign word or sentence, in Hebrew characters, inserted in Hebrew writings. In order to convey to the reader the exact meaning of a Biblical or Talmudical word or sentence not easily explained in Hebrew, some commentators acccompanied the Hebrew word with an equivalent in the vernacular. These glosses, most of which occur in Old French, are of great value to philologists, but unfortunately many of them have been so corrupted that it has become impossible to trace their origin. Not only were numerous mistakes committed by ignorant copyists, who frequently, for instance, confounded ד with ד, ה with ת or ו and ג with י and ג, but the system adopted by the authors of representing the numerous vowels by the Hebrew semi-vowels, , is misleading. Often the copyist, of a nationality other than that of the author, and happening to know the signification of the gloss, changed it to an equivalent in his own language. Thus it is not unusual to find in works proceeding from French authors Spanish, Italian, and even Slavonic glosses. 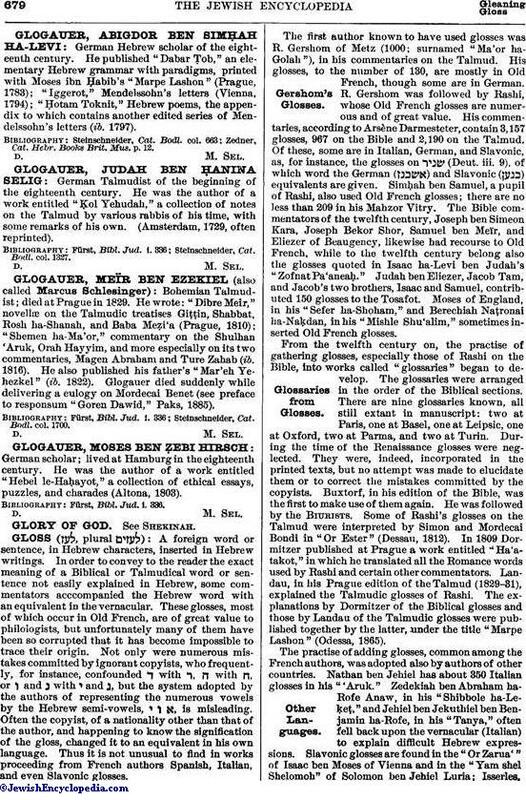 The first author known to have used glosses was R. Gershom of Metz (1000; surnamed "Ma'or ha-Golah"), in his commentaries on the Talmud. His glosses, to the number of 130, are mostly in Old French, though some are in German. R. Gershom was followed by Rashi, whose Old French glosses are numerous and of great value. His commentaries, according to Arsène Darmesteter, contain 3,157 glosses, 967 on the Bible and 2,190 on the Talmud. Of these, some are in Italian, German, and Slavonic, as, for instance, the glosses on (Deut. iii. 9), of which word the German ( and Slavonic ( ) equivalents are given. Simḥah ben Samuel, a pupil of Rashi, also used Old French glosses; there are no less than 209 in his Maḥzor Vitry. The Bible commentators of the twelfth century, Joseph ben Simeon Kara, Joseph Bekor Shor, Samuel ben Meïr, and Eliezer of Beaugency, likewise had recourse to Old French, while to the twelfth century belong also the glosses quoted in Isaac ha-Levi ben Judah's "Ẓofnat Pa'aneaḥ." Judah ben Eliezer, Jacob Tam, and Jacob's two brothers, Isaac and Samuel, contributed 150 glosses to the Tosafot. Moses of England, in his "Sefer ha-Shoham," and Berechiah Naṭronai ha-Naḳdan, in his "Mishle Shu'alim," sometimes inserted Old French glosses. From the twelfth century on, the practise of gathering glosses, especially those of Rashi on the Bible, into works called "glossaries" began to develop. The glossaries were arranged in the order of the Biblical sections. There are nine glossaries known, all still extant in manuscript: two at Paris, one at Basel, one at Leipsic, one at Oxford, two at Parma, and two at Turin. During the time of the Renaissance glosses were neglected. They were, indeed, incorporated in the printed texts, but no attempt was made to elucidate them or to correct the mistakes committed by the copyists. Buxtorf, in his edition of the Bible, was the first to make use of them again. He was followed by the Biurists. Some of Rashi's glosses on the Talmud were interpreted by Simon and Mordecai Bondi in "Or Ester" (Dessau, 1812). In 1809 Dormitzer published at Prague a work entitled "Ha'ataḳot," in which he translated all the Romance words used by Rashi and certain other commentators. Landau, in his Prague edition of the Talmud (1829-31), explained the Talmudic glosses of Rashi. 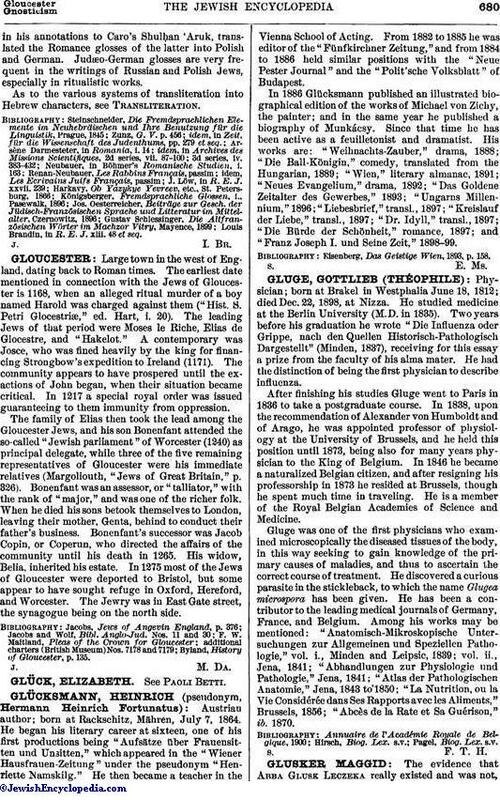 The explanations by Dormitzer of the Biblical glosses and those by Landau of the Talmudic glosses were published together by the latter, under the title "Marpe Lashon" (Odessa, 1865). The practise of adding glosses, common among the French authors, was adopted also by authors of other countries. Nathan ben Jehiel has about 350 Italian glosses in his "'Aruk." Zedekiah ben Abraham ha-Rofe Anaw, in his "Shibbole ha-Leḳeṭ," and Jehiel ben Jekuthiel ben Benjamin ha-Rofe, in his "Tanya," often fell back upon the vernacular (Italian) to explain difficult Hebrew expressions. Slavonic glosses are found in the "Or Zarua'" of Isaac ben Moses of Vienna and in the "Yam shel Shelomoh" of Solomon ben Jehiel Luria; Isserles,in his annotations to Caro's Shulḥan 'Aruk, translated the Romance glosses of the latter into Polish and German. Judæo-German glosses are very frequent in the writings of Russian and Polish Jews, especially in ritualistic works. As to the various systems of transliteration into Hebrew characters, see Transliteration. Louis Brandin, in R. E. J. xiii. 48 et seq.